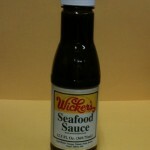 Wicker’s Seafood Sauce is made by starting with Wicker’s Original Marinade & Baste as a base… then making it thicker than Wicker’s Thicker by adding brown sugar and tomato paste. Having seafood for dinner? Wicker’s Seafood Sauce is perfect for dipping boiled or fried shrimp, crawdads, fish or almost anything you can find in the sea. We also use it as a dressing for oysters with a little lemon. Just like all Wicker’s sauces, Wicker’s Seafood Sauce is hand-crafted in Hornersville, Missouri, USA. We realize that Hornersville isn’t exactly a seaport, but when you use Wicker’s Seafood Sauce, we think you’ll enjoy your temporary trip to the seaside even more.